With a server in staging mode, you can make changes to the configuration and preview the changes before you make the server active. It also allows you to run full import and full synchronization to verify that all changes are expected before you make these changes into your production environment. Test and deploy new configuration changes. Introduce a new server and decommission the old. During installation, you can select the server to be in staging mode. This action makes the server active for import and synchronization, but it does not run any exports. A server in staging mode is not running password sync or password writeback, even if you selected these features during installation. When you disable staging mode, the server starts exporting, enables password sync, and enables password writeback. Suppose you have an Azure AD Connect with Password Hash Synchronization feature enabled. When you enable staging mode, the server stops synchronizing password changes from on-premises AD. When you disable staging mode, the server resumes synchronizing password changes from where it last left off. If the server is left in staging mode for an extended period of time, it can take a while for the server to synchronize all password changes that had occurred during the time period. 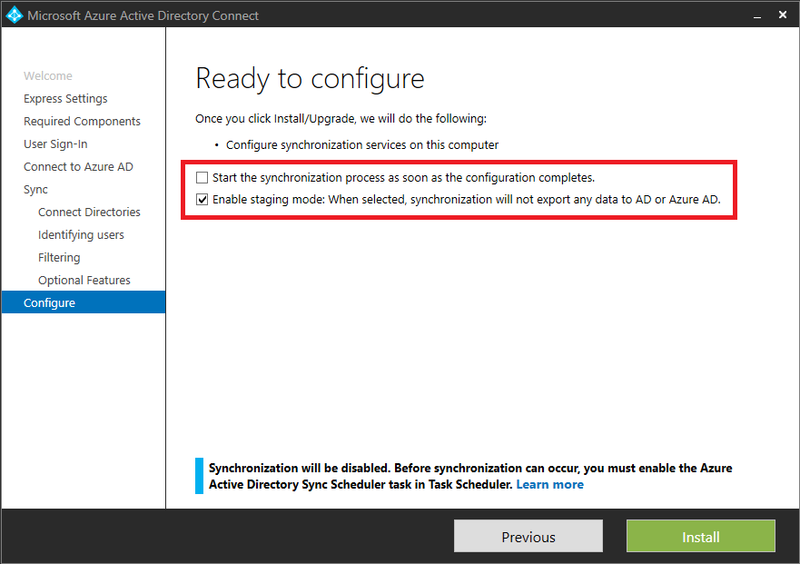 You can still force an export by using the synchronization service manager. A server in staging mode continues to receive changes from Active Directory and Azure AD. It always has a copy of the latest changes and can very fast take over the responsibilities of another server. If you make configuration changes to your primary server, it is your responsibility to make the same changes to the server in staging mode. For those of you with knowledge of older sync technologies, the staging mode is different since the server has its own SQL database. This architecture allows the staging mode server to be located in a different datacenter. Install Azure AD Connect, select staging mode, and unselect start synchronization on the last page in the installation wizard. This mode allows you to run the sync engine manually. Sign off/sign in and from the start menu select Synchronization Service. If you have made custom changes to the primary server and want to compare the configuration with the staging server, then use Azure AD Connect configuration documenter. You have now staged export changes to Azure AD and on-premises AD (if you are using Exchange hybrid deployment). The next steps allow you to inspect what is about to change before you actually start the export to the directories. Run: csexport "Name of Connector" %temp%\export.xml /f:x The name of the Connector can be found in Synchronization Service. It has a name similar to "contoso.com – AAD" for Azure AD. Run: CSExportAnalyzer %temp%\export.xml > %temp%\export.csv You have a file in %temp% named export.csv that can be examined in Microsoft Excel. This file contains all changes that are about to be exported. Make necessary changes to the data or configuration and run these steps again (Import and Synchronize and Verify) until the changes that are about to be exported are expected. OMODT – Object Modification Type. Indicates if the operation at an object level is an Add, Update, or Delete. AMODT – Attribute Modification Type. Indicates if the operation at an attribute level is an Add, Update, or delete. Copy the PowerShell script from the section CSAnalyzer to a file named csanalyzer.ps1. Open a PowerShell window and browse to the folder where you created the PowerShell script. You now have a file named processedusers1.csv that can be examined in Microsoft Excel. Note that the file provides a mapping from the DN attribute to common identifiers (for example, displayName and userPrincipalName). It currently does not include the actual attribute changes that are about to be exported. 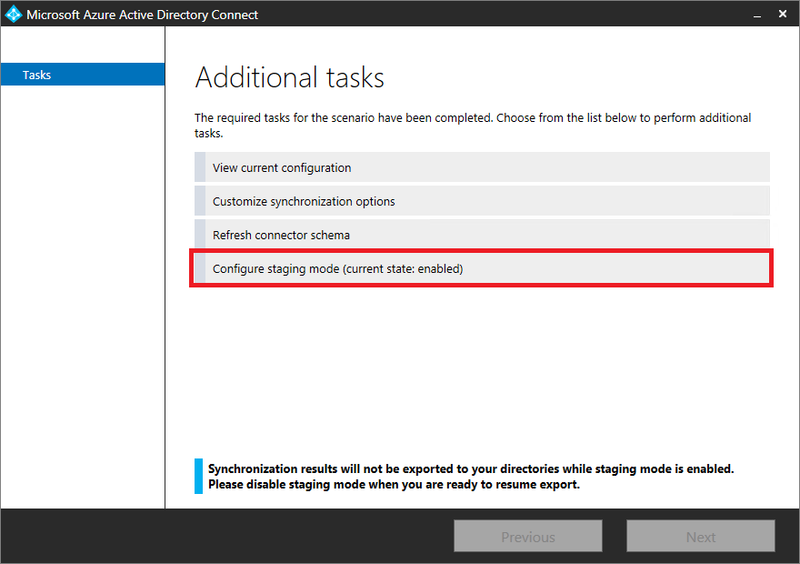 On the currently active server, either turn off the server (DirSync/FIM/Azure AD Sync) so it is not exporting to Azure AD or set it in staging mode (Azure AD Connect). Run the installation wizard on the server in staging mode and disable staging mode. What is your tolerance for not being able make changes to objects in Azure AD during the downtime? If you use password synchronization, do the users accept that they have to use the old password in Azure AD in case they change it on-premises? Do you have a dependency on real-time operations, such as password writeback? Have a spare standby server, known as staging mode. If you do not use the built-in SQL Express database, then you should also review the SQL High Availability section. A viable strategy is to plan for a server rebuild when needed. Usually, installing the sync engine and do the initial import and sync can be completed within a few hours. If there isn’t a spare server available, it is possible to temporarily use a domain controller to host the sync engine. The sync engine server does not store any state about the objects so the database can be rebuilt from the data in Active Directory and Azure AD. The sourceAnchor attribute is used to join the objects from on-premises and the cloud. If you rebuild the server with existing objects on-premises and the cloud, then the sync engine matches those objects together again on reinstallation. The things you need to document and save are the configuration changes made to the server, such as filtering and synchronization rules. These custom configurations must be reapplied before you start synchronizing. If you have a more complex environment, then having one or more standby servers is recommended. During installation, you can enable a server to be in staging mode. For more information, see staging mode. A common and supported method is to run the sync engine in a virtual machine. In case the host has an issue, the image with the sync engine server can be migrated to another server. If you are not using the SQL Server Express that comes with Azure AD Connect, then high availability for SQL Server should also be considered. The high availability solutions supported include SQL clustering and AOA (Always On Availability Groups). Unsupported solutions include mirroring. Support for SQL AOA was added to Azure AD Connect in version 1.1.524.0. You must enable SQL AOA before installing Azure AD Connect. During installation, Azure AD Connect detects whether the SQL instance provided is enabled for SQL AOA or not. If SQL AOA is enabled, Azure AD Connect further figures out if SQL AOA is configured to use synchronous replication or asynchronous replication. When setting up the Availability Group Listener, it is recommended that you set the RegisterAllProvidersIP property to 0. This is because Azure AD Connect currently uses SQL Native Client to connect to SQL and SQL Native Client does not support the use of MultiSubNetFailover property. See the section verify on how to use this script.